The Parkhotel is situated in a large park in one of the most pleasant locations of Cracow, just 13 km away from the city centre. It is a privately owned hotel which offers high standard of services for reasonable prices. 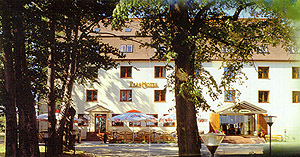 The Parkhotel can accommodate 82 guests. The double bedrooms come with bathroom, TV and telephone. There is also a car park next to the hotel. The hotel restaurant and a drink bar are open from 7 am to 11 pm and offer a complete menu at moderate prices. We can also cater for large groups. Our garden, a natural extension of the restaurant, makes our hotel and attractive place during the summer tourist season. If you are planning or organizing a banquet, reception, conference or symposium our conference room for up to 60 people is an ideal place for your event. We can provide you with conference services as well. During the Summer, the grass and trees in the park surrounding of the hotel create relaxing atmosphere and give opportunity of full rest from turmoil of the big city. Welcome to the Parkhotel. We will do our best to make your stay here comfortable and pleasant. Hotel accept credit cards: American Express, Dinners Club, EuroCard, JBC, MasterCard, VISA i Polcard. The hotel is located at the E-40 route Cracow-Katowice, 13 km away from the city (railway and bus station), 15 km away from the airport. The bus 32 goes from Cracow to the hotel. From the hotel you can easily reach other nearby places of interest and tourist attractions such as Wieliczka (45 minutes car drive), Auschwitz or Czestochowa (70 minutes car drive).